Still recovering from an explosive family get-together, Tarot-reading mistress of the House of Swords Sara Wilde isn’t ready to return to the war on magic. Then the Magician of the Arcana Council uses Sara to summon an ancient Greek deity for his own devious purposes, and Sara’s suddenly up to her elbows in over-sized egos and millennia-old conflicts. Conflicts that imperil the delicate balance of power between the most formidable mortals on earth and the gods who lay beyond the veil. Wow, just wow! 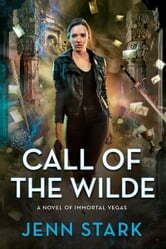 Another action packed book by Jenn Stark. It took me a little longer to get into this book than normal as there are a lot of story lines going on: Gamon, SANCTUS, Dixie, Nikki, Brody, The Magician, The Devil, The Ant Men and lots of other characters, Gods and Goddesses make an appearance and all seem to have their own storyline to Sara. In this book Sara finds out that friends and enemies are closely related and to trust no one but herself. We again fly all around the world and the authors descriptions of places and people are wonderful and it is almost like you are there and those people are standing in front of you! The action in this book is top notch and it makes you think about how one woman can go through so much and still keep standing. I especially liked the development of her relationship with The Devil and it will be interesting to see where this goes. I don't want to give any spoilers away! Read the book and then be a little sad that you have to wait until December to see what happens. I was given this ARC copy for an honest review. Again you have brought my imagination to the front. I love living in Sara's mind thankyou for the such a brilliant adventure again. Thank you Jenn for another captivating adventure. I picked up the first one through book bub and fell in love. I really enjoyed the strength and truth of Sara in this particular novel.